After a great first week of marathon training, I had to curb my enthusiasm and my miles this week due to a slight tendon strain. I still ran more miles this week than I did on an average week during my last marathon training cycle. 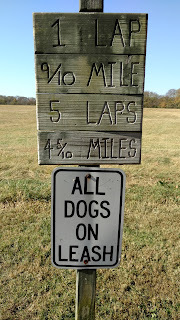 I was so pleased with my run at the Nashville Stones River Greenway (NSRG) last week, I decided to do it again. This time it was 15° warmer than last week. 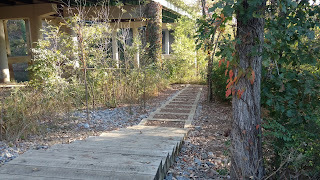 I also wanted to make it up to the end of the trail where it crosses the Cumberland River and connects up with the Shelby Bottoms trail. So I skipped any of the side trails and ran straight up. One thing that bugs me about this trail is the lack of water along the length. I'm SO spoiled by the Murfreesboro Stones River Greenway that has water fountains at least every 3 miles, not to mention real bathrooms at 3 good places strategically placed. But the NSRG has hills! Elevation (at least in total) comparable to what I'll face in the Chattanooga Marathon. So I really want to be able to incorporate the NSRG into my training plan. And to do that effectively, I have to be able to get water. So this run was about running, sure, but also about finding places to get water. Not knowing exactly what I'd find, I went prepared with 4 10-oz bottles on my fuel belt and my 18-oz handheld all full of water. I did get a snarky comment from a cyclist during my cool down about how much water I was carrying, but he was gone before I could respond. At the 3 mile mark, the trail passes Khol's on Lebonan Road. I had thought about going into Khol's to see if they had any water for sale, but I hesitate to go into a store when I'm actually in the middle of my run. I decided I would try that on the way back if I needed to. The trail then passes under Lebanon Road and there are stairs down to the river. If I had a water filtration system, I could go get water there. 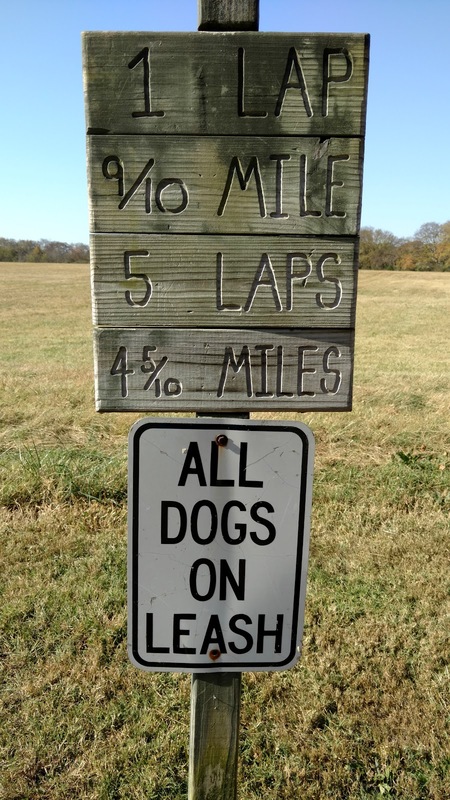 The dog park is right at mile 7. 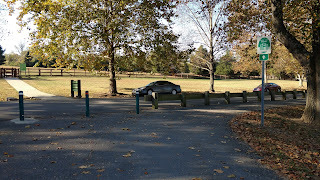 There is a water fountain at the entrance to the dog park, which is across the street from the Two Rivers Park Trailhead. I didn't go check to see if it was working because there were lots of people around and I still had water, but I did note its presence. 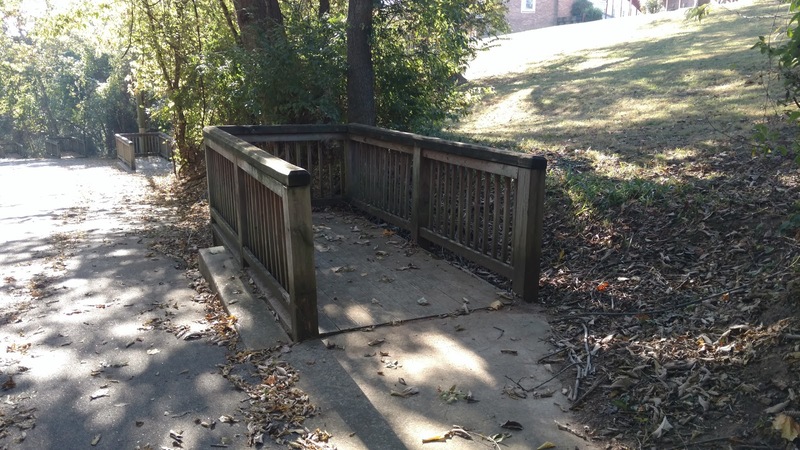 One entrance to the dog park. This is not the one with the water fountain. 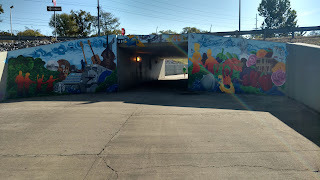 Tunnel under Briley Parkway. Love this mural! Frustrated I ran on, under Briley Parkway (this is pretty cool, btw!) and across the pedestrian bridge over the Cumberland River. This is where I turned around. 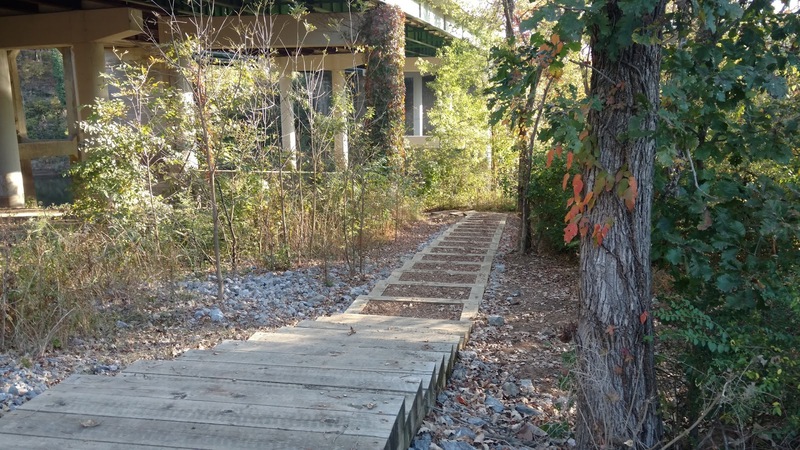 The path continued down to hook into the Shelby Bottoms Greenway, but I was already past half my mileage and still had to run back to the south end of the trail. On the way back by Wave Country, I stayed on the path instead of going by the Wave Country entrance where the vending machines were. I ran past the Skate Park. As I was watching the skaters, I caught sight of a water fountain at the other side where their entrance was. Doubling back, I went around and the water fountain worked! Yay. I refilled my 2 empty 10-oz bottles on my belt and added more water to my handheld. It wasn't a water bottle fountain, but the water went high enough to easily fill my small water bottles. Next, I ran down the little road with the picnic shelters and found a restroom with running water. So I could fill my water there if need be. Now that all my exploring was done, it was time to get down to business and finish out the run. 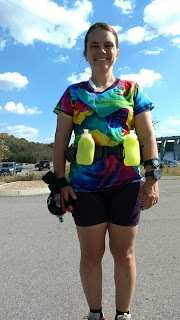 I headed back on the trail with my water bottles full and my bladder empty. At mile 10, I ate an entire Picky Bar. 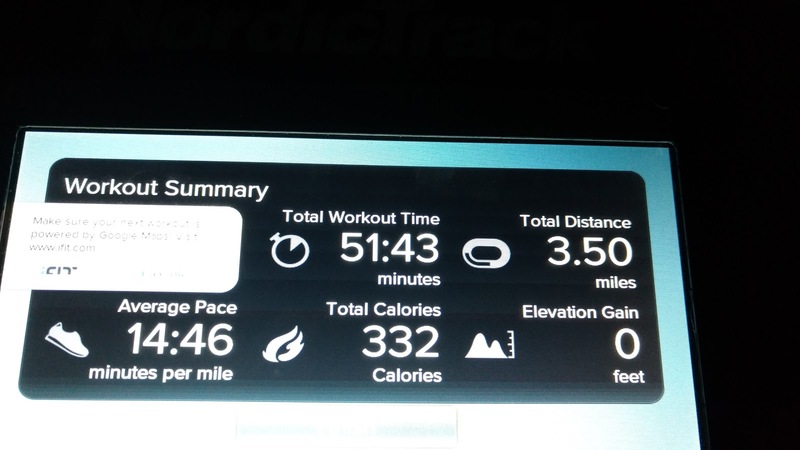 Normally I just eat 100 calories every 45 minutes, but I have a problem with getting a little nauseous on runs over 13 miles, so I'm experimenting on how to fix that. This was a normal eating interval, I just ate the 200 calorie bar instead of half of it. It didn't help; I still got nauseous a couple miles later. On a steep hill, there were these little pull offs all the way down. Wheel chair emergency stops?? 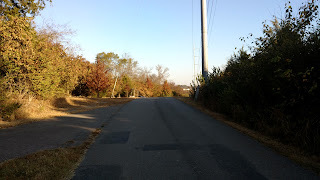 About the time I got nauseous, I started to have trouble maintaining my pace while running. I did maintain it though. I pushed through even on the hills. On the last big hill before my cool down, I hit the hill on a running interval and kept running until my watch chimed to walk. I did drop to a walk, but when my watch said to run again, I just couldn't. So I kept walking and when I crested the hill, I picked up a run again. Even running downhill was getting to me, but I kept it up. Due to my exploring to find water, I ended up hitting 16 miles about a mile and a quarter from the trailhead. I went ahead and walked. I might could have pushed and gotten 17, but I was done. I meandered back to the truck, pausing several times to stretch. I also downed a lot of the water I had on me. Very happy to be ALL DONE! Back at the truck, I got changed and got into the driver's seat to go home. And noticed my lower back hurt a good amount. While running, I had 4 water bottles on my fuel belt. 2 at the back and 2 at the front. Fairly balanced. When I needed water, I took it from the front two bottles first. This meant the bottle on my left lower back was always full since I was able to find water. 40 oz of water is a lot of weight and required me to cinch up my belt tighter than I normally would. Fortunately, there was no bruising and the pain went away after a day. In the future, I think I found enough water to carry my handheld and a couple of water bottles, not all 4. This was not a very pretty run. Looking at my splits, my pace wasn't that far off my regular pace except for when I was trying to get a bottle of water from the vending machine and headed to the restroom. My average HR for the last 4 miles, though, reflects how hard I was working on those miles. My last mile was run at an average HR of 172. Definitely still need practice at the 16 mile distance. During the afternoon, I felt a few twinges in my right inner thigh, but chocked it up to a hard run. It wasn't really bad. Just a twinge here and there. A bit of tenderness. This was an easy run on the treadmill. I felt the same tenderness on my inner thigh during the first mile, but warmed out of it. Tuesdays are tempo run days. Supposed to be run at 12:36 - 12:30. This one ended up a tad fast. I went to Jerry Erwin Park in Spring Hill during lunch. This is a small park with a 0.9 mile paved loop. To get my 5 miles in and a warm up and cool down, I did the loop 6 times. The first 3 I did clockwise, then turned around to do the last 3 counter-clockwise. I still wanted to quit every single time I passed the parking lot. I much prefer either a long loop or an out and back. At least when you get to the out, you HAVE to come back. But running past my truck 5 times before I could stop was mental torture. This was a warm run at 86° and that didn't help. I also had trouble concentrating and getting my breathing right. My right inner thigh was sore for almost the entire first mile before I warmed up out of it. But by the time I got home, I was really feeling it with every step. So Tuesday was my last run of the week. I originally was scheduled for another easy run and a hill run, but I decided to let the leg rest and hope I can get back to it soon. I think I ran too much uphill too soon. I probably should have either walked more of the hills on my long run or just gone and done my long run at the Murfreesboro Stones River Greenway with less elevation. My right leg injury is going to affect this week at least and then I'll see where I am. I have a half marathon scheduled on the 20th and I'd like to make that run if I can. It has a 4 hour time limit, so even if I go really slow, I can do it. I probably won't be anywhere close to a PR, but I want the experience of it as I've never done that run before.